With a shift in the American consciousness moving more towards health and sustainability, the US tea industry is booming. Sales grew from $6 billion in 2005 to $10 billion in 2012. People have experienced the hopped-up-on-coffee phase of their lives, and are looking for a more balanced beverage to consume. From cool new teahouses, traditional and funky tea ware, to thermometers and bamboo tea trays, these leaves of art are the ‘in’ thing. Americans are showing a strong interest in the meditative quality of teas, as well as becoming knowledgeable connoisseurs in the art of the perfect steep. Interested in yoga, Buddhism, music and art, these women and men of America are sipping their way into a new counter culture. Was it our rebellious nature against the motherland that caused us never to embrace the joy of High tea? Were we scarred by bad memories such as Ye’ Ol’ Boston tea scandal? I am sure our forefathers would forgive us now, knowing that we can buy direct from the tea growers themselves. Tea is the most widely consumed beverage in the world after water. England even has a time of day dedicated to the tea leaf. Although both tea and coffee contain caffeine and tannic acid, tea is far lighter in both ingredients. The Linus Pauling Institute has shown a caffeine content of tea is between 9-72 mg/8oz, while coffee contains between 72-130 mg/8oz. The tea leaf is full of antioxidants such as catechins and polyphenols, which help combat the free radicals we face in our everyday lives from pollution and stress. Free radicals break down cells, allowing valuable cellular nutrients to leak out which can lead to many common ailments. Antioxidants can help protect you from environmental stresses and also help reduce inflammation. Antioxidants have also been show to protect against cancer by fighting any pre-cancerous activity. Studies have also shown that athletes’ cellular performance increases with a higher intake of antioxidants. Tea is known to be full of the amino acid L-Theanine, which helps to increase mental acuity and to decrease stress. By causing relaxation, L-Theanine can also help the cardiovascular system. These important nutrients in tea bring on a state of calm but also stimulate the mind, helping to stay alert and focused. It is no wonder why the spiritual communities of the world have a tradition with this age-old beverage. The origins of tea have two well-known legends, both incorporating herbalism, yoga and spirituality. The Japanese legend gives credit to the Southern Indian royal prince Bodhidharma, an enlightened Buddhist master, who was thought to have brought tea to China. Bodhidharma had been at the Shaolin Temple teaching the monks yoga poses to increase stamina, alertness and to combat sleepiness while in mediation. One day while Bodhidharma was meditating he fell asleep. He was so upset with himself that he cut his own eyelids off so that he would never fall asleep again. Where his eyelids fell, the first tea plant grew out of the ground. A gentler story according to Chinese mythology involves the Chinese Emperor, Shen Nung, who was also an esteemed herbalist. He believed in drinking boiled water for health, and one afternoon while sitting under a tree, a tea leaf fell off its branch and into his pot. Shen Nung enjoyed the flavor and health properties of this new infusion so much that he then started to cultivate it. An herbal tea has no actual tea in it at all. The correct word for an infusion of flowers or herbs comes from the French word tisane. Black, white, oolong, green, silver and gold teas all come from the same plant, Camellia sinesis. 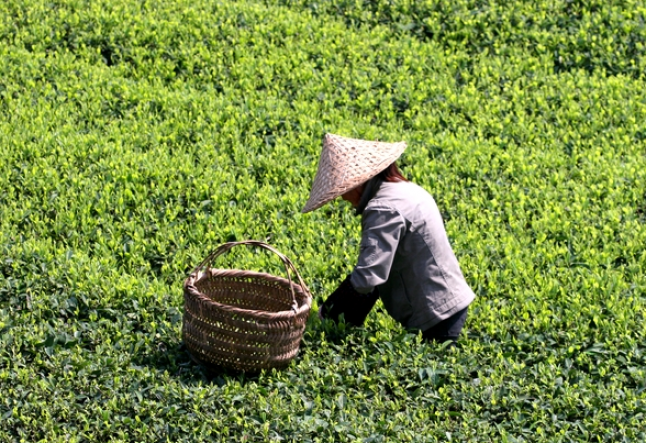 Variations in the part of the plant that is used, the level of oxidation, and a variety of age old processes will result in a particular variety of tea. Different techniques such as steaming or pan-frying the leaves result in myriad flavors ranging from vegetal, floral or buttery, to hints of chocolate; some chefs have been to known to pair tea with food, much like wine. Once a tall tree, the tea plant was cultivated into bushes for easy picking; the top two leaves and the bud are harvested for the worlds delight. It is mostly grown in the humid, misty mountains of India, China, Vietnam and Taiwan. In enjoying the art of a good cup of tea, quality is everything. Things to look for when choosing are a full leaf tea, which is organically grown and Fair Trade certified if possible.